P & G – Rescue or Destroy? Environmental tragedies in all parts of the world seem to be escalating. The news is filled with heroic rescue efforts and many groups of people have come together to make these rescues possible. Some of the more famous rescues include the 33 miners trapped in Chili, or the US Airways Flight 1549 that Captain Sullenberger landed in the middle of the Hudson River in 2009. One of the largest, but little known, rescues in history happened between October and December 1856 in the state of Wyoming, western USA. In order to move as many immigrants as possible across the plains to what is now Utah, the Mormon Church instituted the handcart companies. Between 1856 and 1860, 2,962 people in ten companies of handcarts walked, pushed, and pulled all of their belongings across 1,300 miles from Iowa City to Salt Lake City. The carts held between 250 and 500 pounds. Each company was accompanied by several wagons which hauled extra supplies. The two largest companies, the Willie Company with 500 people and the Martin Company with 665 people left in late August 1856, against advice and policy. Progress was slow, they made several miscalculated decisions along the way, and the poorly constructed handcarts broke down often, which combined for a difficult, harsh journey. Sadly, church leaders in Salt Lake City were not apprised of the nearly 1,200 handcart pioneers or the wagon companies, so no supplies had been delivered to forts and other stations to aid the travelers as was the established procedure. The companies left Florence, Nebraska between August 22 and 27. The two wagon companies that were supposed to accompany the carts left even later. By October 4 rations were being cut from 16 oz. of flour per adult to 12 oz. a day. The cart-loads were lightened in hopes of speeding up the trip. Bedding and clothes were abandoned along the trail. Shoes were wearing out and many people were walking barefoot or wrapping rags on their feet. On October 14 an advanced search party out on the trail left the main supply wagons to locate the four companies. On October 19 an early snowstorm hit with a vengeance, and the last of the meager flour was issued out by the Willie Company. The search party found the Willie Company with news that relief wagons were coming; then continued on to find the last three companies. The Willie Company were finally met by the wagons on October 21, in a frozen state and starving. The rescue party split up with 6 wagons staying with the Willie Company and the rest continuing on for the Martin Company, and the wagon companies; a veritable ‘needle in the haystack’ search. The next five weeks were brutal for everyone, rescuers and pioneers alike. By October 30th the last three companies had been found, word had reach Utah of the desperate conditions, and more help had been dispatched. A total of almost 400 volunteer rescuers and 250 wagons assisted the handcart and wagon companies in distress for over two solid months in the dead of winter. This rescue took alignment of purpose, resources, knowledge, and most importantly, people. These rescuer pioneers literally left their harvests, and livelihood for the coming winter and shared their scant resources, for a greater purpose. The organization for help turned into a successful rescue because of alignment of purpose and people. What makes a rescue? The Cambridge Dictionary states: to save someone or something from a dangerous, harmful, or difficult situation. This definition does not include the organization needed behind the scenes to be effective. A successful rescue includes organizational alignment. Market share erosion and low organic sales growth. Aging brands and a lack of breakthrough innovation. Suffocating bureaucracy and excessive costs which create structural drags on the business. Board complacency about, and rewarding management for, continued underperformance. Weak corporate governance which entrenches existing problems. Shareholder returns less than half that of peers’ over a decade; bottom quartile over most recent time frames. Short-term thinking (selling businesses vs. fixing businesses, cutting ad spending last quarter, etc.) that doesn’t address the root causes of P&G’s challenges. 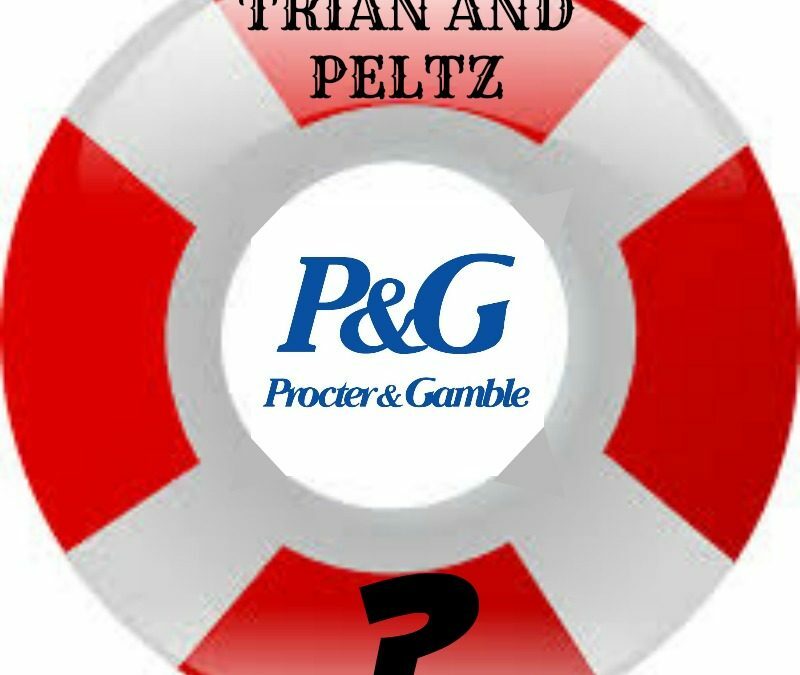 Trian, Mr. Peltz’s hedge fund company, issued a whitepaper on P&G that is 93 pages of charts and graphs depicting the terrible and sorry state of the company versus its peers. This seems to be the pattern Trian uses against the companies it becomes involved in. Trian sets a target price for the stocks and if the target is not reached then a whitepaper appears depicting everything that is wrong with the company. They also outline measures to improve the stock price. For GE this includes cutting costs. Companies rarely look at cost cutting as a way of introducing innovative processes or systems changes. Generally cost cutting is achieved by restructuring and the slice-and-dice, methods to cut people, jobs, products, etc. Time and again it has been proven that this method demoralizes the entire company culture, leaving massive distrust in its wake. Procter and Gamble can expect exactly the same kind of treatment as GE if Peltz is elected to the board. Focusing on the short-term, market-share price is a near-sighted strategy. With this kind of myopic vision, a company cannot achieve high performance. High performance is a factor of six elements, none of which have to do with the stress of meeting numbers. With leadership spending its time keeping Trian happy and Wall Street happier, it leaves little attention on the most important stakeholders; customers, employees, and supply chain partners. There is no mention of any of these stakeholders in the whitepaper. “In statistics, everything is based on simplifying mathematical assumptions,” says Burke Powers, one of the architects of IBM’s Watson Analytics tools. Those assumptions must be translated into human behavior in order to make change happen. Data, analytic, and numbers are the product of a careful aligned relationship between these stakeholders. To leave them out may give short-term big numbers for Wall Street, but will create longer term disasters. Some companies that focused primarily on short-term gains are Enron, Wells Fargo, and General Motors. Has the “bailout” rescued GM from its eroding results? The Trian whitepaper is extensive, filled with fact-mingled inaccuracies and out-of-date information. One is lost in the carefully worded rhetoric that is often exactly opposite the present P&G strategy. P&G has a developed strong culture over years led by men of integrity, service, and values. Those values may appear old fashion to some. It is these intangibles that have made P&G great and will continue to make it a great company. Peltz represents a very different culture and set of values. He is not aligned with what P&G wants to achieve or the way P&G plans to get there. Peltz does not offer rescue, instead, he offers disaster.